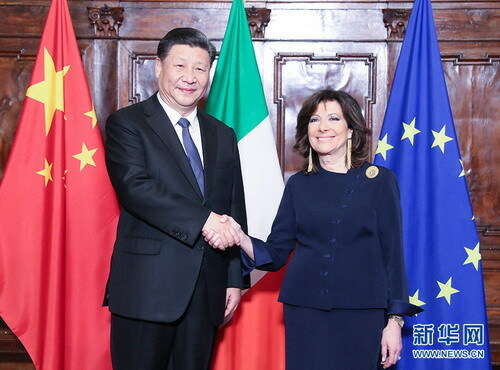 On March 22, 2019 local time, President Xi Jinping met with Senate Speaker Maria Elisabetta Alberti Casellati of Italy in Rome. Xi Jinping pointed out that China and Italy have enjoyed a traditional friendship, with the ancient Silk Road closely linking the two peoples. Since China and Italy established diplomatic relations nearly 50 years ago, bilateral relations have seen healthy and stable development, and the two countries have become important partners who trust each other and work together. The visit is meant to consolidate the stability and strategic nature of the China-Italy relations in the long term, and comprehensively elevate the level of the mutually beneficial cooperation. The Chinese side is willing to enhance high-level guidance with the Italian side, respect each other's major concerns, jointly build the Belt and Road Initiative, explore third-party cooperation, boost cultural exchanges and local-level cooperation, and consolidate the public opinion foundation for bilateral relations. Xi Jinping stressed that in recent years, China's National People's Congress and the Italian Senate have established a regular exchange mechanism. The Chinese side supports the two countries' legislative bodies to carry out multi-level, wide-ranging and multi-channel exchanges and cooperation, and share successful experience on major issues such as legislative supervision, state governance, national economy and the people's livelihood, on the basis of mutual respect and mutual learning. It is hoped that the Italian Senate will continue to play an active facilitating role, and create better conditions for and inject greater momentum into the development of bilateral relations. Maria Elisabetta Alberti Casellati expressed that the Italian Senate warmly welcomes President Xi Jinping's visit. The Italian people and the Chinese people have always trusted each other and maintained profound friendship, with close relations in such fields as economy and trade, and culture. I agreed with President Xi Jinping on his remarks published in leading Italian newspaper Corriere della Sera about the traditional friendly exchanges between the two countries for thousands of years. Italy and China are major countries that boast a rich culture, and the Italian side is willing to boost communication and cooperation with the Chinese side in such fields as culture, art, language, heritage protection, tourism, science and technology, and innovation, and encourage the youths to increase exchanges and mutual understanding. The Italian side looks forward to enhancing cooperation with China on jointly building the Belt and Road Initiative through President Xi Jinping's visit. The history of Italy-China exchanges for the past 50 years has been a history of dialogue and friendship, and the Italian Senate is willing to facilitate exchanges between the two countries' legislative institutions, and continue to make contributions to deepening Italy-China friendly cooperation.